Chronic Renal Failure (CRF) is one of the leading causes of illness and death in our older cats. By “older” we mean aged seven or more. However, kidney disease can also affect younger cats, and it is of paramount importance that cat owners remain vigilant for the early signs of this invariably lethal illness. There is a wide range of causes of kidney damage, ranging from bacterial infections, dental disease, blockages in the urinary tract, poisons such as antifreeze, inherited disease, age, and even certain medicines. Indeed, so numerous are the possible causes that it is frequently impossible to identify the specific cause for a particular cat. It is also difficult to spot the early signs of kidney disease, but if we remain alerted to the demeanour of our cats then there is the possibility of our preventing irreparable damage. Most typically your cat will start to drink more water and to urinate more frequently and in larger quantities. A poor appetite and weight loss will usually follow, with signs of lethargy as well. Sometimes just a change of behaviour such as being less sociable or hiding away more is noticed. Although these symptoms can often be caused by many less serious health problems, it is extremely important to take your feline companion to the vet as soon as you notice any of these signs. At this stage, it is sometimes (but not always) possible to stop or at least slow down the disease process. Your vet will need to do blood and urine tests. Until recently the commonest blood tests measured the levels of ‘urea’ and ‘creatinine’, both of which are normally excreted by the kidneys. An increase in these levels would lead your vet to suspect kidney disease because the kidneys should be cleaning the blood of these chemicals. However, there is now a new blood test which measures something called SDMA. This test can pick up the very early stages of kidney disease when there has only been about 40% damage to the kidneys. Previously, creatinine may not have been raised until about 70% of the kidney tissue had already been damaged. This new test has the potential to allow us to detect kidney disease very much earlier than in the past, and it will be extremely useful when used as part of a routine screening blood test – since the SDMA will start rising long before there are any clinical signs of the disease. It is also very much more specific to kidney disease than creatinine. Another advantage of this test is that tells the vet how well the kidneys are filtering the blood. A urine test may also be required in order to ascertain how well the kidneys are concentrating the urine. If kidney disease is then diagnosed your vet will recommend a recognised kidney diet and probably medication. If the early signs are missed then the disease will progress towards Chronic Renal Failure (CRF) – but do not blame yourself if you had not previously noticed that your cat was unwell. Unfortunately, cats are notorious for hiding their illnesses, and the early symptoms referred to can easily be missed – particularly with outdoor cats. There is no cure for CRF. However, with regular monitoring and the correct diet and medication, your cat may well have many more months and even years of high-quality life ahead. When your cat reaches the CRF stage numerous changes are taking place in his/her body. The kidneys are not filtering out the waste products properly; particularly the urea and creatinine referred to earlier. Neither are they producing adequate ‘erythropoietin’ which stimulates the bone marrow to produce red blood cells (see our pages on Anaemia). High blood pressure, increasing dehydration, and muscle and bone weakness are a few of the other problems now being faced. By now the symptoms are far more apparent. In addition to the increased thirst, frequent urination, decreasing appetite and loss of weight, your cat may well be displaying any number of the different clinical signs of kidney failure. A few examples are vomiting, emaciation, muscle wasting, eating its cat litter, lethargy, eye problems, a poor coat, constipation, and depression. We have already said that there is no cure for CRF, but regular medical treatment added to your care can usually provide a good quality of life for your much loved CRF cat. In addition to the correct diet and medication, occasional intravenously provided fluids may well be needed to correct the dehydration. This is not a painful procedure and can result in considerable improvement. 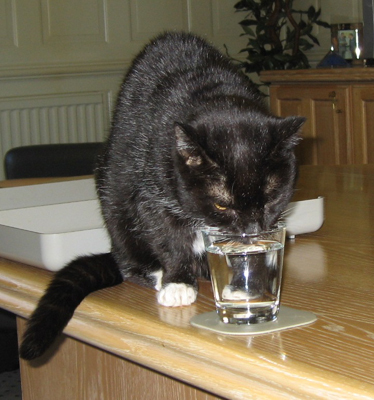 Giving additional fluids at home is a great help, with the provision of more fresh water bowls in the various locations frequented by your cat. The water can be flavoured with white fish or chicken (but nothing salty) as an added encouragement for him/her to drink. It is highly likely that treatment will be necessary for the additional conditions attendant with CRF. Anaemia is high on this list, and we would again draw your attention to the paper on this subject written by Mr Eric McCarrison on this website. Your vet will also be able to help reduce high blood pressure and nausea, and many of the other symptoms. A problem which is now more able to be addressed is the excessive levels of phosphate which is building up in your cat’s bloodstream. Vets are now using drugs called phosphate binders, which increase the excretion of the phosphate from the blood. The rate at which CRF progresses will vary from cat to cat, but whether it be in months or years there will come a time when you know that your beloved friend is now suffering despite all your very best efforts. This is a truly devastating time, and you have probably grown even closer to your little companion during the period of his or her illness. Never-the-less, your love must now be demonstrated to the fullest extent possible, no matter how heartbreaking it is for you. Your cat is relying entirely upon you to repay his or her love by bringing a prompt end to the suffering by asking your vet to give that final injection which will send your playmate to a place that is free of pain. "I believe cats to be spirits come to earth. A cat, I am sure, could walk on a cloud and not come through."